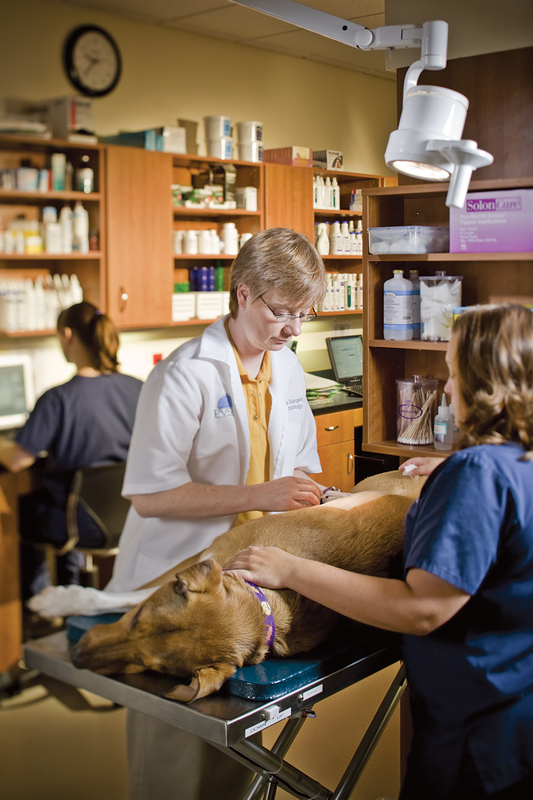 Pittsburgh Veterinary Dermatology was founded in August 2003, filling a void in veterinary dermatology services in the greater Pittsburgh area. In 2006, Dr Sandra Sargent DVM DACVD returned to the Pittsburgh area where she grew up and took over the dermatology practice. She purchased the practice in 2008 and Pittsburgh Veterinary Dermatology remains independently owned and operated. Patients are currently seen at both the PVSEC North and South facility. Dr Detwiler DVM DACVD joined the practice in July, 2018. Pittsburgh Veterinary Dermatology is currently the only specialty dermatology practice between Philadelphia and Akron and Columbus, Ohio. The dermatology department provides the quality dermatological care your pets need, treating a variety of animals including dogs, cats and small and large pets. Veterinary dermatologists are experts in treating skin allergies, ear diseases and many other skin disorders. We do require a referral to schedule a consult. This aides us in scheduling your pet appropriately. Referral information should be faxed or called in by your primary care veterinarian to schedule your pet's appointment. Upon scheduling your pet's appointment, we ask that you complete a comprehensive questionnaire. Please find the links to the questionnaire below. Please complete the questionnaire prior to your pet's initial consultation. This will provide us with a detailed overview of your pet's dermatologic history for diagnostic purposes. Our nursing staff is available at the time of your appointment should you have questions. Click here to complete the new patient questionnaire. Click here to download the Introduction Letter.